ChristianMatchmaker.com is committed to helping single Christians connect and meet in the hopes that a potential love connection will be made. 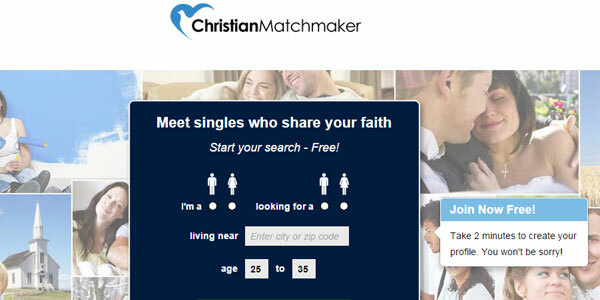 The ChristianMatchmaker dating site operates much like its competitors. Users are able to search for potential matches based on a variety of criteria ranging from age and physical appearance to what denomination they claim and how often they attend worship services. The site includes convenient features, including a matches tab where users can find potential dates that the system's algorithm has determined might be compatible. There is also a favorites tab so that you can easily access people that sparked your interest. One of the best features on ChristianMaker.com is the "Who's Online" tab, from this tab, members can see how many people are online and how many of them meet your specific criteria. The page shows photos and basic information such as age, body type, and where the person lives (the site even tells you how many miles apart you are from your potential match). Signing up for the site was extremely easy and took literally less than five minutes. As with any dating sites, the site asks about your basic appearance and body type. You'll be asked about your faith, including your denomination, calling, and how often you attend services. Finally, you'll be given the opportunity to select the basic characteristics that you are looking for in a match, including their denomination and involvement. As with most dating sites the initial signup process is speedy because the site administrators want you to get online and start interacting with other people. However, once your basic information is entered and you're online browsing through pages and pages of potential mates, you'll notice that you won't get much attention unless you fill in the rest of your profile. 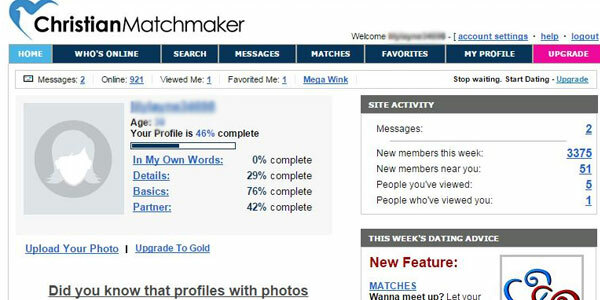 ChristianMatchmaker's "My Profile" section really gives users a simple and descriptive way to "market" themselves to potential dates. There are several sections users can fill out with as little or as much information as they are comfortable sharing. Users are encouraged to post photos to better their chances of being contacted by potential dates. Photos are easy to upload and definitely make the profile more appealing as others scroll by. The site does post warnings against sharing personal information that would make you easy to find. There is also a safety information section of the site, although, it is relatively small and doesn't offer too much more than typical common sense advice. Visitors are routed to the safety page which appears to reside on a web administrator's site, which may be confusing for people who aren't very internet savvy. The basic service is free, however, certain features, such as being able to read any emails sent to you, are only available if you upgrade to a membership. A membership ranges from $29.95 for a single month to $119.95 for a year. These prices are definitely reasonable compared to other dating sites. As far as websites go, this one is pretty standard. There aren't a lot of bells and whistles or fancy graphics, just the necessities, however, what the site lacks in appearance, it makes up for by being extremely user friendly. Users can see recent activity such as who around them is online, how many people have viewed their profile, if anyone has "favorited" them and if they have any messages. Users can also conduct searches right from the home screen. 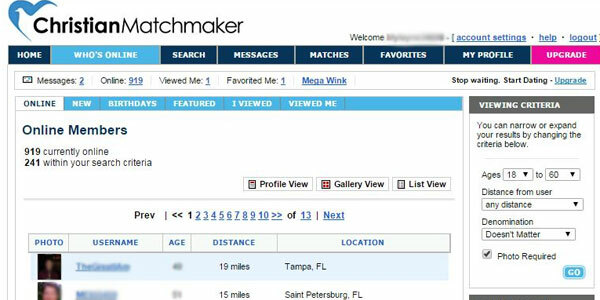 ChristianMatchmaker.com's search engine is definitely easy to use and understand as it features basic criteria in order to search for potential partners such as location, photos, age and relationship type. The advanced search offers a lot more effective option since you’re able to further your search by religion, values, lifestyle and common interests. ChristianMatchmaker.com definitely has all of the pieces of the puzzle to help make love connections. To get the most success from this site, answer as many of the in depth questions on your profile, and be honest! Now you're ready to hop on and take advantage of the search engine, "who's online" section which are the highest value components of this site. If ChristianMatchmaker.com doesn't feel like the right fit for you, take a few moments to check out our review of ChristianMingle.com, users routinely rate their app as one of the best!